Yeah, I know you are thrilled. However the new medicare tax only affects those with higher MAGIs (Modified Adjusted Gross Income). Those MAGIs are $250,000 Married Filing Jointly and $200,00 Single for 2013. The new medicare tax goes into effect in 2013. In 3 1/2 months. So, time to start thinking about your income tax strategy if this affects you. 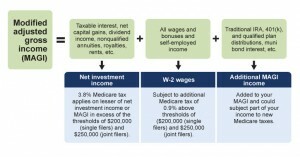 While you don’t want the tax tail to wag the investment dog, it still makes sense to ensure you at least know how any profits you take against your sales will be impacted with the medicare tax. At the end of the day, it’s a nice problem to have.